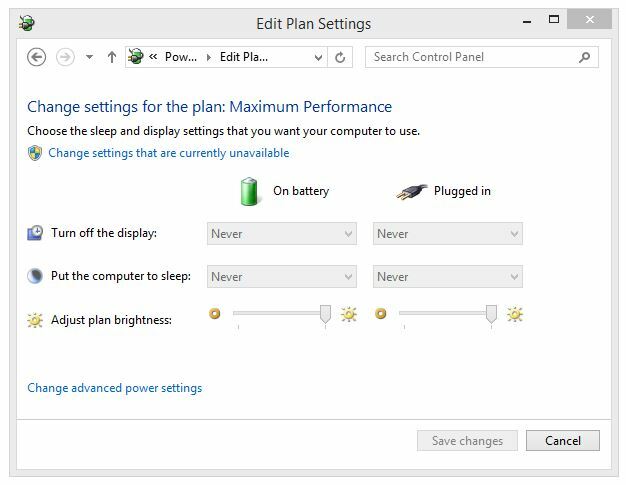 The funny thing is, when testing battery life, you will often use Power Plan settings that make no sense for real-world, everyday usage scenarios. What battery life depends on more than anything else is whether a notebook is idle or busy. If the notebook is idle, the best thing you can do is put the machine to sleep as quickly as possible to avoid wasting too much energy essentially on doing nothing (or very little, since even when a computer is idle, it’s still running the OS, checking in with peripherals, refreshing the RAM, handling interrupts and so on and so forth, without necessarily doing much for the computer’s user). If the notebook is busy, the best thing to do is to strike a variety of compromises between high performance (which consumes lots of power) and throttling back (which consumes less) on screen brightness and CPU activity (the two biggest energy suckers on notebook PCs, in terms of actual power drain over time). As with any kind of compromise, one must accept certain trade-offs when setting intervals. It does take some time for a computer to wake up when it goes to sleep, so you’ll want to avoid going to sleep too terribly quickly, to avoid having to pay the “wake-up penalty” after pausing to think before entering input into a text window, or while reading a page of text. That’s probably why Windows sets the default in many power plans in the 5 to 10 minute range to give users enough time to cogitate and reflect between key presses or mouse clicks to let the OS know they remain actively engaged. On the busy front, one must choose how dim one can stand screen the screen to be in active use, then select a dim-out interval at which to cut that level in half without likewise interfering overmuch with productivity and real-world use. In our testing, Gregory and I observed that he had no trouble going to 40 percent brightness for regular use, and 20 percent for dimmed status, while I (with my sexagenarian eyeballs) couldn’t really tolerate much less than 60 percent (80 preferred) for workaday use, and 40 percent for dimmed status. We also observed that trimming spin-down or turn-off intervals for most devices with timeout intervals (HDD, display, LAN/WWAN, and so forth) had a noticeable effect on battery life, but that managing sleep (when idle) or screen brightness (when active or busy) had the biggest overall impacts. The former played heavily when idle, and the latter when busy, so a fruitful combination of the two actually resulted in the best overall battery life. Careful examination of the Maximum Battery Life and Energy Saver Power Plans (or their moral analogues from vendors other than Lenovo) will show that their engineers agree completely with this approach. If you tune your power plan to fit your normal working modes, you’ll probably agree as well.